We are happy to announce the release our new version Vinna 2.0, the 4th Generation Document Processing Platform. Since the last major release, a year ago, we have worked hard – and a big thanks to the team – to focus on enterprise features that make Vinna’s capabilities unique in the market. Main emphasis was put on easy and secure deployment into runtime environments in a customer infrastructure. 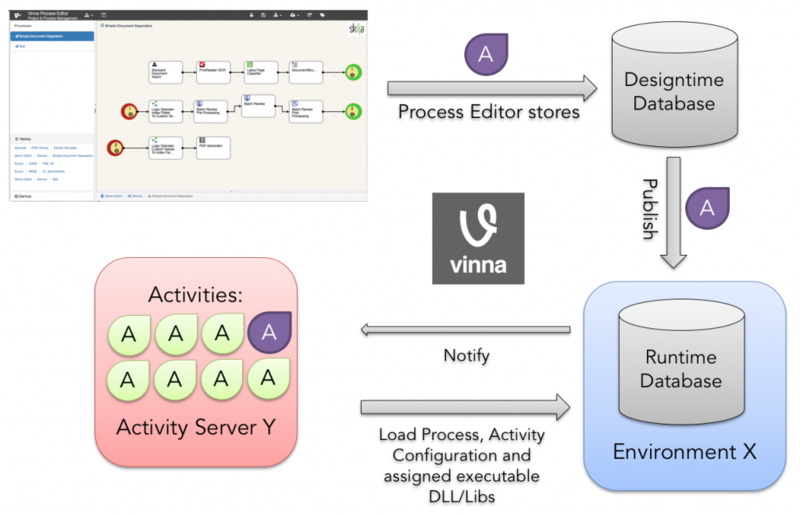 Vinna allows designing and testing of a process completely outside of production and then using a built in staging system to move it securely to production. This step is called publishing. Vinna 2.0 allows the administrator to also configure the actual runtime environment completely from central Process Editor by distribution of activities to activity servers, assignment of reservations and definition of priorities. A process is such automatically deployed to a target environment and to the activity servers including all configurations but also all binaries. This is schematically shown in the graph below. At no time the runtime server need to be accessed except through a browser and HTTPs protocol. In addition processes are versioned in design and in runtime to avoid any interference of new settings with existing production work items. Support for Oracle, Azure SQL, Azure Blob has been added on top of existing MS-SQL and NoSQL databases. Variables allow to predefine connection strings, import paths and any other parameter specifically for each target environment. One example: In a test system you might define a user with admin rights on a lookup database for testing purposes but this user will be automatically be replaced with a more restricted user on the production system. Vinna is an open and process oriented platform, that allows users to define a process in exactly the way as it is optimally operated in a company. The design allows full flexibility in the data model with a hierarchical document model supporting batches, folders, documents, pages. The documents are processed as work-items in the flow and passed through activities. The activities are either standard tasks like OCR or Classification, or custom tasks as integrations into the platform. 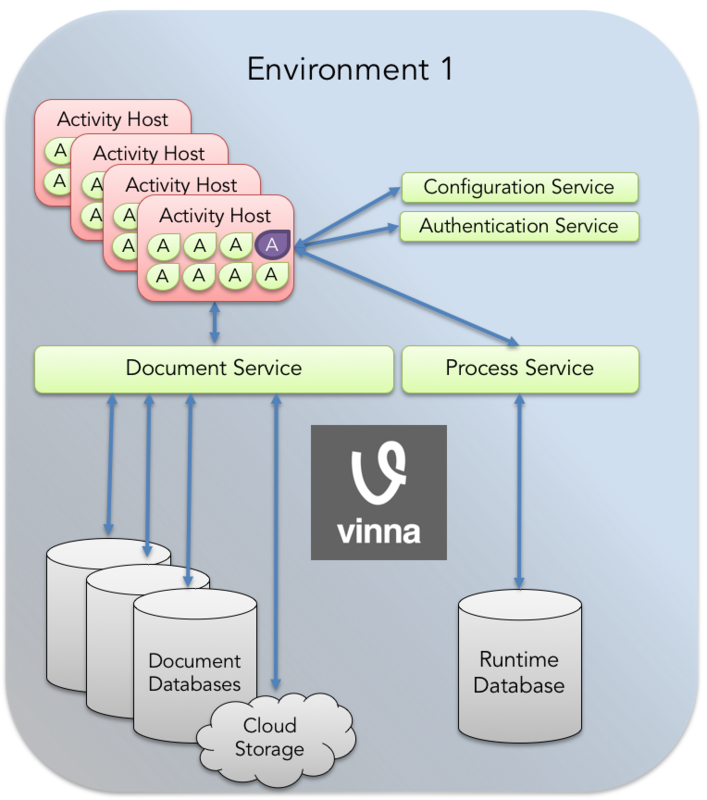 Any number of activities can be defined in the process as micro services, including arbitrary routing decisions based on intermediate results.The architecture of Vinna is service oriented (SOA) and the runtime is easily deployed either in the cloud (Microsoft Azure or private cloud), on premise or in mixed environments where the data storage is kept in house and processing happens outside. All communication between services and databases is transaction based, securely encrypted and uses standard REST protocols over HTTP and HTTPS. Three powerful HTML based graphical user interfaces are provided for defining, managing and monitoring processes. Whitepaper and data sheets are available if you are interested in further details, please contact us through info(at)skilja.com to obtain your copy.